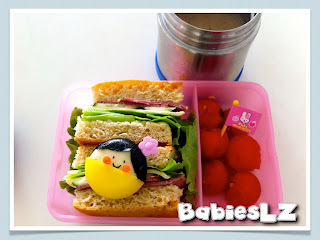 In the box: Roast beef sandwich with foccasia bread, babybel cheese, mushroom soup (in container) & watermelon. 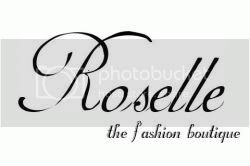 Today my girl had English oral examination.... Which means exams has begun... So far, I hardly worry about her English oral coz she yaks alot. Hehe... Just hope she knows when to stop! 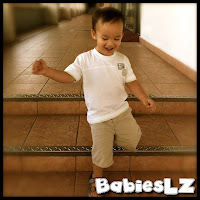 Beanie hardly have any chance to learn climbing up & down the stairs. Going to the bookstore is a good time for him to practice that. 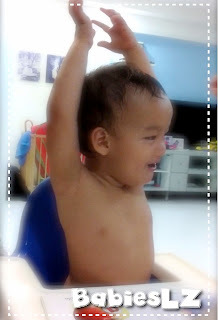 See how happy he was when he was able to do it on his own. 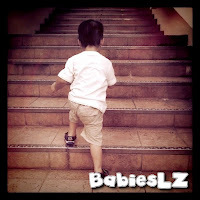 I like the way he turned back to see how many steps he has climbed, the way he said "yeah!' when he did it and the way he called for Z as he was going up. Beanie is a happy boy, he often seen with a smile on his face. Everyone says that, including my neighbours. 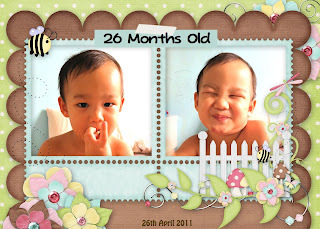 I'm very blessed... ♥ I remembered I was so stressed when I was pregnant with him. 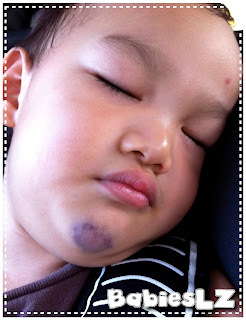 I was so afraid that it will affect him and I end up with a grouchy baby. I thank GOD for giving me a beautiful & cheerful baby. ♥ He loves stacking things. Recently he's into stacking their piggy banks. ♥ He likes puzzle. 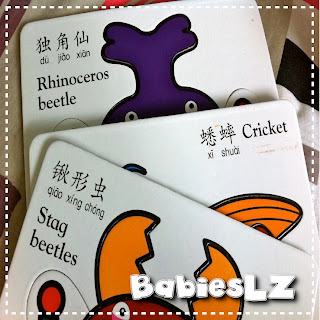 Bought him these and he enjoyed it very much and at the same time, he learns about the bugs in English as well as in Chinese. 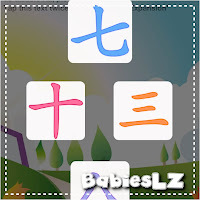 ♥ Iphone apps: He likes playing with this apps, learning numbers & shapes in Chinese. Her's a video of him repeating after me. He refused to say it on his own. 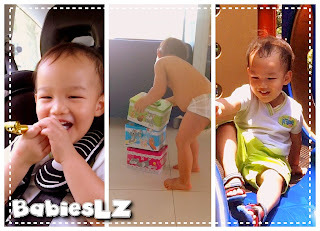 ♥ Enjoys playing with L's baby Alive! He said baby wants to drink water. ♥ Little one started calling me mommy. 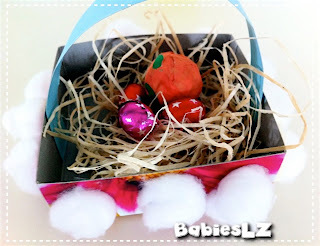 Small Easter basket that he brought home from school. He played with it for a long time. 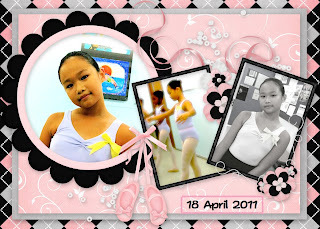 My princess went for her ballet grade 2 exam this morning.... Had to miss 2 lessons at school, unlike last year, she missed school to whole day. She insisted on going to school so as not to miss any lesson. Even though this was her third exam, she is still very nervous. Coz she has not been going for the extra lessons as often, due to loads of homework from school. 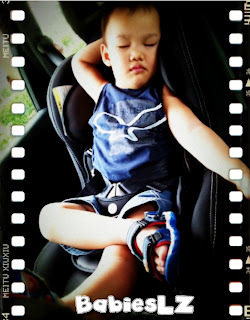 Sometimes she was just too tired to go for lessons. It was a long wait today, compared to last year. Besides the few of them there were older girls ahead of them. 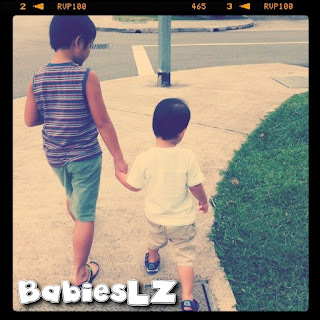 It gave them opportunity to practice more with their teacher and mingled with her friends too. Regardless of the outcome, I know my girl enjoys dancing. Hope she will do well for the exam. 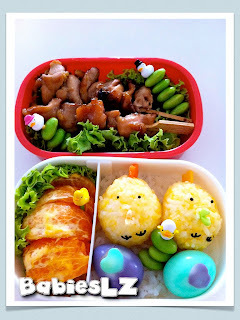 In the boxes: Rice, drumlets, egg rolls, easter chocolate eggs, sliced oranges & fine beans. 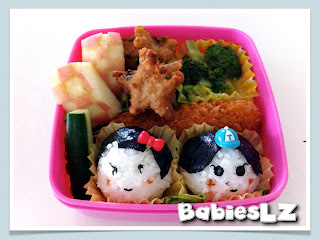 An Easter bento for my girl. Shaped the bunny using the cookie cutter that I have. 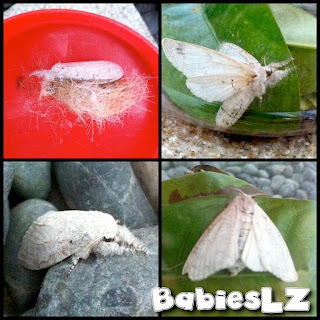 Have you seen a white butterfly? Or is it a moth? This was the caterpillar that we found the other day. In the boxes: Baked pasta with mushroom sauce, sliced oranges, heart sausages, chicken sticks & harsh brown. I have another box of pasta to clear and I will have more coming in when my dear cousin comes back from Italy. She is my 'supplier' for all the cute pasta, it's so much cheaper and more selections. 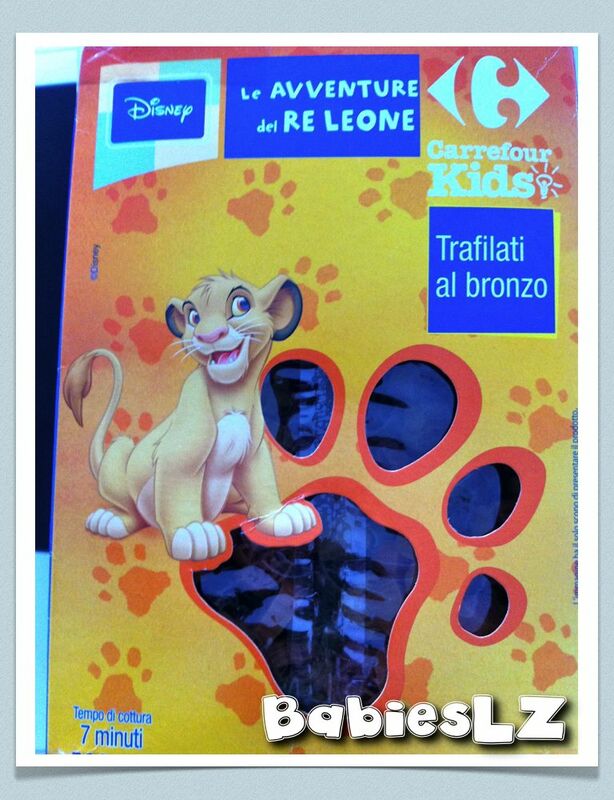 As soon as she heard my kids like the cartoon character pasta, she's been getting boxes for me whenever she's back. Thanks Sis for all the pasta! Does it look like penquin? Aiyo... I didn't cook my rice well today. It was not sticky enough and I had a tough time trying to shape it. AND the shapes I cut out didn't come out nice too. Saw the roast pork when I was at the market and couldn't resist getting it for lunch. Save me the hassle of cooking a dish. 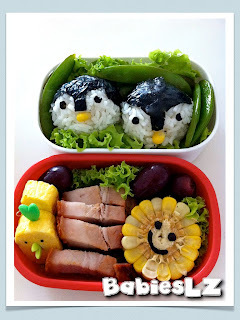 Hehe... Z wanted egg for his bento and I added in 2 pieces of the egg roll for him, decorated it with the picks. Odd right? Chicks & penguins. 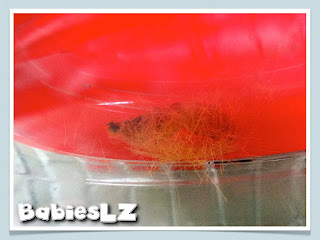 The caterpillar that we caught is at the next stage now! 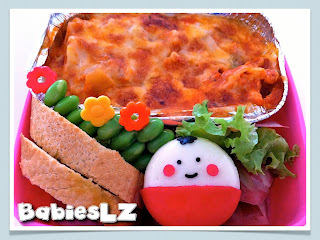 In the box: Baked pasta, garlic bread, edamame, babybel cheese & water apple. 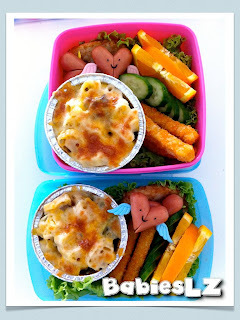 My girl requested for pasta again, so I prepared baked pasta (slight difference from the previous bento). She finished everything coz what I packed today was all her favourite. She loves cheese, especially babybel. She often complained that she's fat and yet she's taking lots of it. I'm not stopping her from eating, she's just a growing child and she does exercise. In the boxes: Pasta with tomato sauce, mini corn dogs, grapes & strawberries. We used to buy corn dog at cold storage, then I thought, why not make some instead of buying? I was so happy to find cornmeal the other day. Wonder if it's me only, it took me so long to find it. 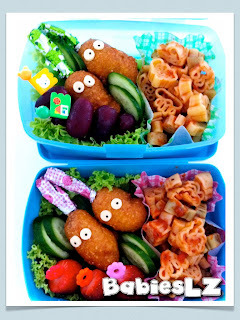 LZ were happy to have corn dog for their bento. 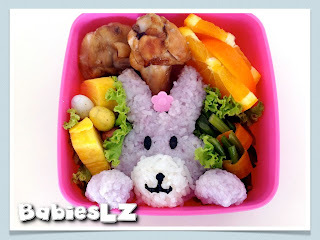 I feel bad that Z's last bento was quite plain, no colour and I recently prepared a rilakkuma bento for L. So today's bento, I tried to make it more colourful & cuter for him. Phew! 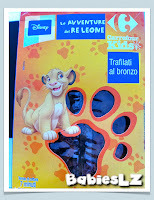 Happy that my boy liked it. 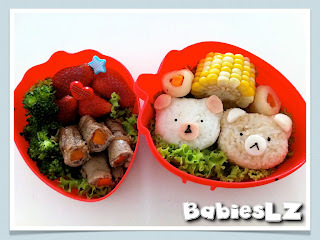 In the boxes: Beef rolls with carrots, broccoli, strawberries, corn & Japanese fishcake. My gal's latest craze is Rilakkuma and I have not prepared any rilakkuma bento for her. Tried making one for her lunch and this is the best that I can come up with. I bought her a rilakkuma umbrella, her last year birthday pressies, her cutlery box & her lunch note papers are all about rilakkuma too.